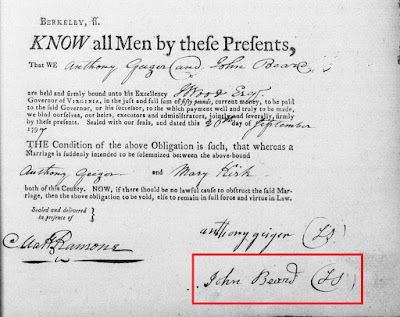 My fellow blogger Janice Harshbarger (and maybe cousin) turned me on to a possible clue that may help me solve one of my most pressing genealogy mysteries: who were the parents of my fifth great-grandfather Thomas Kirk and what were their ancestral origins? Thomas Kirk was born in 1778 in, most likely, Virginia, and settled in Licking County, Ohio where he died in December 1846. There's little documentation that sheds light on his pre-Ohio existence or the identities of his parents. Janice commented last fall that she had a Mary Geiger in her tree whose maiden name was Kirk. Mary lived with her husband Anthony in Licking County at the same time as my Thomas (check out Janice's blog on Anthony and Mary Geiger). Could Mary be Thomas' sister, Janice wondered? About this same time, a DNA match appeared on Ancestry for an older Kirk cousin whose kit I administer. This match - estimated to be a 4th to 6th cousin - had a tree that included (drum roll, please) Mary Kirk Geiger. Fourth to sixth cousins would share third to fifth great-grandparents. 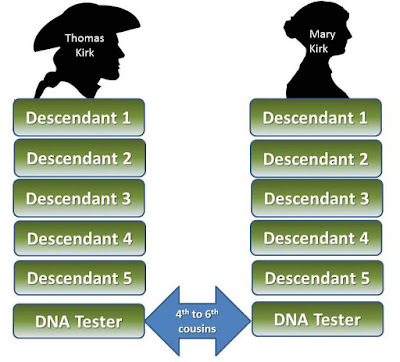 In this particular scenario, if Thomas and Mary were siblings, their parents would be fifth great-grandparents to both DNA testers. Could there really be something to this theory that Mary was a relative to Thomas? The genetic match seemed to reinforce Janice's conjecture. 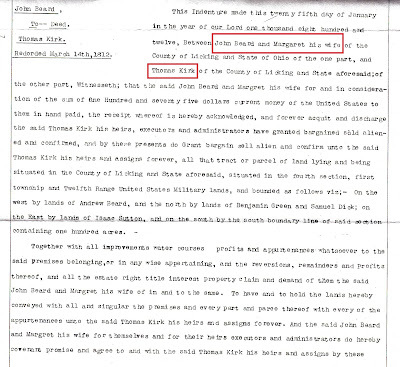 The most curious bit of evidence, though, is a marriage record for Anthony Geiger and Mary Kirk. Their marriage bond, dated September 27, 1797 in Martinsburg, Berkeley County, Virginia (now West Virginia), indicated that "a marriage is suddenly intended to be solemnized between" them. The bond was between Anthony Geiger and John Beard who was the surety (bondsman). Typically, these bonds were made between the groom and a family member of the bride - not always the father - sometimes a brother or uncle. Anthony Geiger and Mary Kirk marriage bond with John Beard as surety. 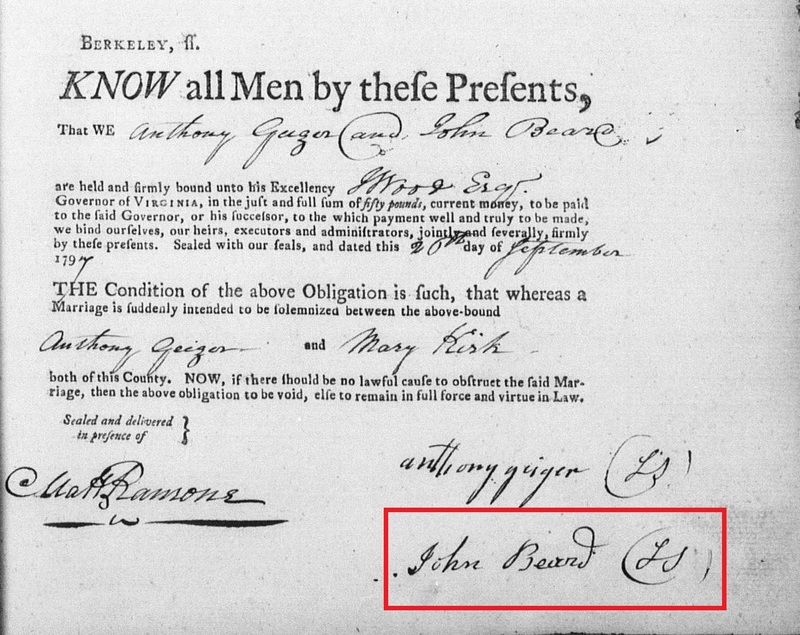 The name John Beard means something to my Thomas Kirk research. 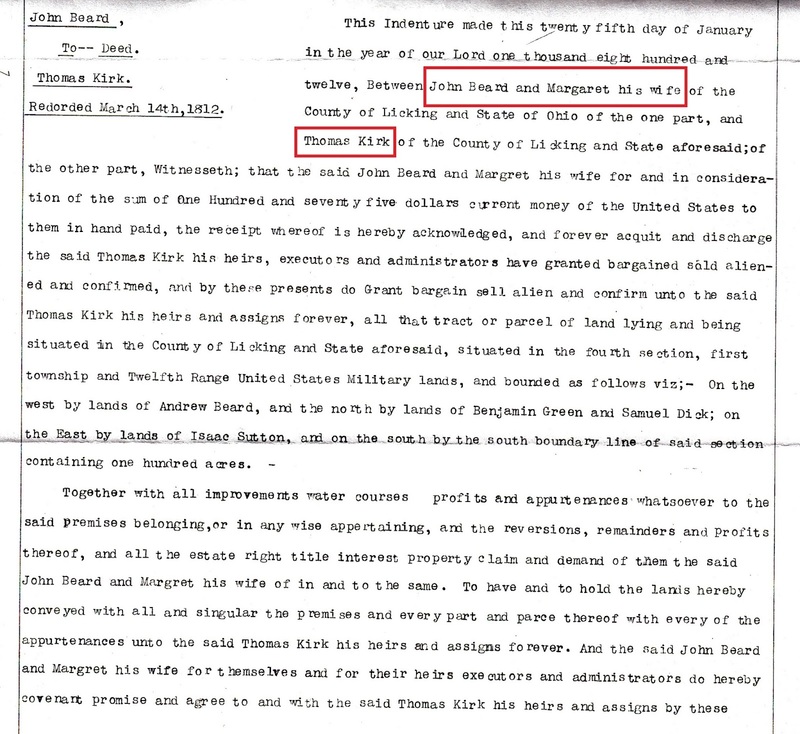 A John Beard lived in Licking County in the early 19th century, was married to a Margaret Kirk (relationship, if any, unknown), and sold my Thomas 100 acres of land in Licking County on January 25, 1812. Land deed between John and Margaret (Kirk) Beard and Thomas Kirk. In the written record, John Beard links Mary (Kirk) Geiger and my Thomas Kirk. Is it too much to infer a familial link existed? If one did, what type of relationship? Were they siblings? The DNA match is for a relatively distant relationship, and autosomal DNA becomes less reliable for each preceding generation. But the clues keep stepping over themselves suggesting the two individuals were somehow connected. Was Mary a sister to Thomas and, as a result of the ravages of time, that relationship is now undercover? The search is heating up. This new cast of characters - Mary (Kirk) Geiger and John Beard - hold great potential for helping me surmount one of my most impenetrable brick walls. I have a similar scenario only the DNA connection has NOT been found. Allen Cameron who went bond with my William Dempsey in 1799 was the husband of a Dempsey lady (md. 1795). 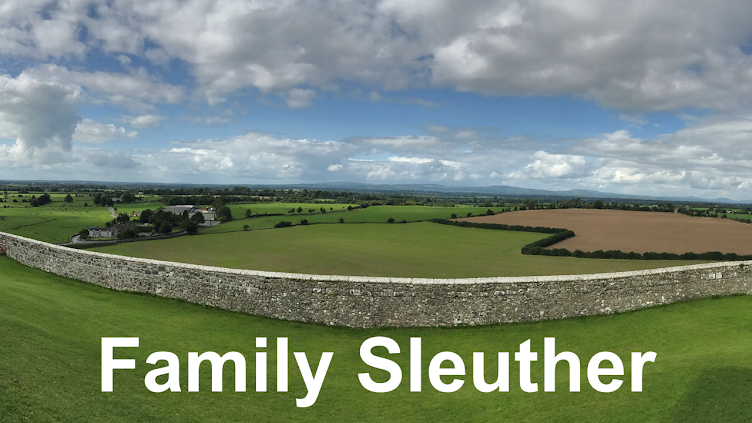 William was under age and a tiny slip of paper was found in a box of loose papers in the county courthouse in which Susannah Dempsey gave permission for her son William to marry. It was witnessed by Cameron. We can assume relationships which are not clearly noted but all others have to be proven in some way. I guess you've just added a huge to-do item to my list. I will be checking matches for surnames (of Cameron descendants) in hopes finding a similar connection. Licking County grew pretty quickly, but in 1810 its population was just over 3800. The earliest map I have of the county - labeling property owners - is after Thomas' 1846 death. I'm on the search for an earlier version and wishing the land records would be digitized, so I could quickly pinpoint everyone's proximity to each other. Autosomal DNA is so finicky with its recombination and random inheritance. Here's hoping you locate a cousin who did get the genetic material you're hoping to find and help corroborate your other evidence. There are researchers who speculate that John Beard's wife Margaret Kirk was a sister to my Thomas. However, I've always paused over her age (purportedly born in 1758) vs Thomas' (born in 1778). It made me wonder if Margaret was more likely an aunt to Thomas. But even a third cousin can show as no match! Thanks, Janice. I think we are! If you get a chance to ask about pre-1846 maps of Licking County that label property owners, that'd be a helpful resource. I also wonder about newspaper accounts of Mary (Kirk) Geiger's death and/or Anthony Geiger moving to Indiana. Fascinating! Although in my case DNA that far out would establish nothing because of endogamy, it seems more reliable in cases like this. Good luck piecing it all together. Yeah, that would be a concern on my maternal lines going this far back. Thanks for the well wishes. Here's hoping this research angle yields results.